By the time I was grafting the toe, the sock stripes, once again perfectly matched up.. So only a small portion at the top of the ankle/instep don't match. Good enough. This creates a strong line of decreases. This time, I reversed the decreases, and started with K2, K2tog, and on the other side, an ended with a SSK, K2-- The out come (shape wise) is identical—but the effect on the toe is a set of feathered decreases. A subtle difference that you might not have noticed if I didn't take a close up of the effect. It's a bit easier to see the feathered effect on the left side of the image. It's one of the things I like about sock knitting—there are so many opportunities of small, detail changes. There are the BIG choices (yarn, gauge, direction) and then a myriad of minor details to chose. Starting with Cast on choices—Doesn't matter if you work toe up or cuff down—there are lots of cast ons to chose from. Top down has a few more choices—but only because Top down offers so many ways to create a cuff. The default choice is ribbing—and ribbing can be 1 X 1, or 2 X1, or 2 X 2,or... well there are lots of ribbing patterns that work (including twisted and 2 color corrugated ribbing) –but ribbing is just ONE of hundreds of choices. 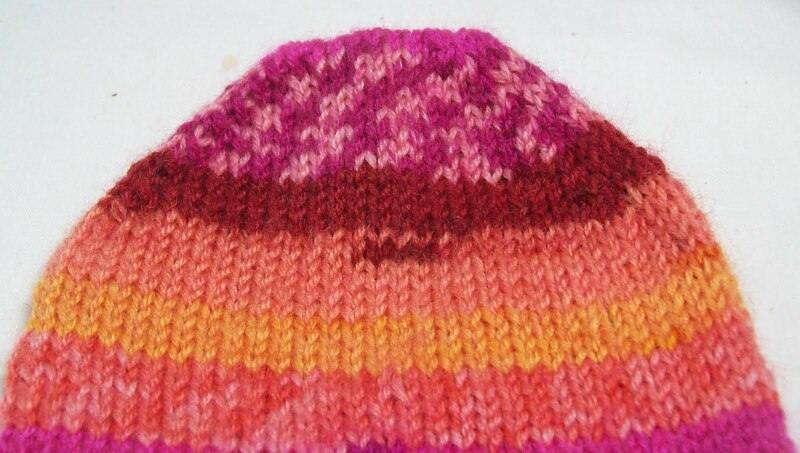 Chevrons, or feather and fan, or other ripple or other stitch pattern that fold and compress stitch tension are another whole set of choices. As are cross wide bands for the cuff—these can be garter stitch (and striped garter stitch is a great choice!) or seed stitch, or I-cords (cast on) or cables—there are lots of patterns that work well. The list goes on—ruffles, lace, ridges—More, too, things I've forgotten or just haven't thought of! I don't think—even with 12 pairs a year (on average) I will exhaust all the choices in my life time. 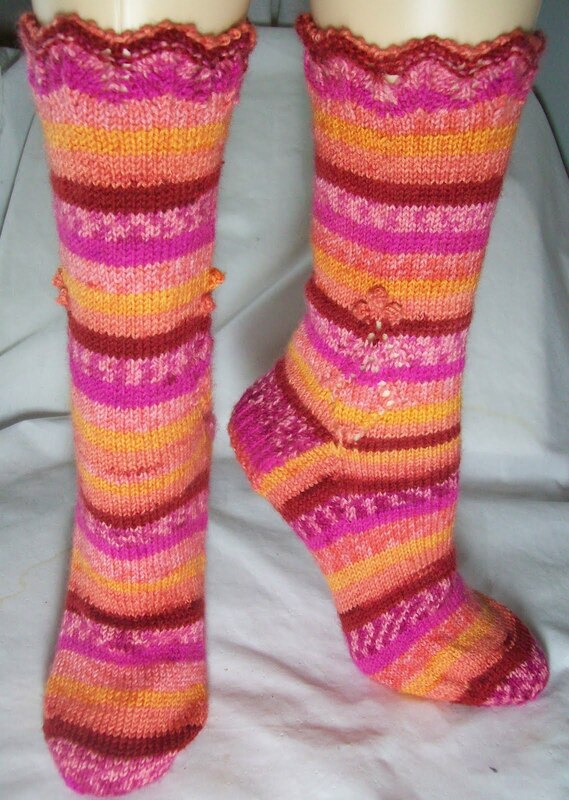 I don't think I have come close to yet—with a hundred of pairs knit! And a bonus—from back in the doldrums days a few weeks ago—another bottle sock (that brings me up to 4 of them) got knit. It's hardly counts--one of those things I can knock out in an evening--and put to use right away. This is bottle sock 4--enough I think. But I can always make more for gifts. (and I might). I am going to order some legs but want to find the best ones out there and not dark yellow plastic if it can be avoided, you know?